Quickly see your calendar from any tab using the Chrome Extension by Google. One click in any screen of your Chrome browser and you can see your schedule and event create new events! Google Calendars allow you to create custom calendars to use for any purpose you need. It’s good for things like a team calendar. Another idea is to create specialised calendars that you can enable and view only when you need to so that your regular calendar doesn’t get too cluttered, an example is I have my Stripe due payments synced to a custom calendar and if I need to see what payments are due I just enable it. Project and release schedules is another as that can be quite busy on it’s own. Then name your calendar, set the sharing and you’re done! Sharing your calendars can be really useful, you can set global sharing settings in your Admin panel > Apps > G Suite > Calendar > Sharing settings (Ask your admin to do this for you if you need) OR share your personal/custom calendars individually. This is great for keeping contractors in the loop with projects etc. The share settings are down the bottom, and have two parts to it. You can make it public or share to your domain, or share it to individuals. The members will only see blocked out sections and no details of the event such as name, description etc. They can not change anything in the event. The members will be able to open the event and see all the details but can’t change anything in the event. The members will be able to change the schedule, name, description of the event. The members will have full access to the calendar including adding and removing members. It’s a pain when you send a meeting request, someone else can’t make it so they email you to change the event time… checking this option will allow them to send an update to the meeting for everyone to accept. 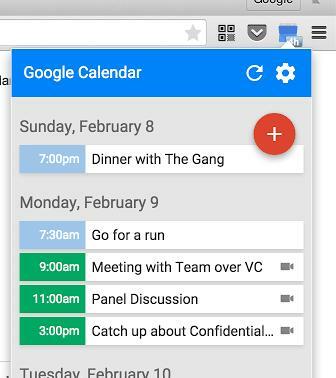 Even better is the Suggested Times feature, if the end users have allowed access to their calendars or they use Google Calendars then Google will be able to show you the best times for the meeting that everyone is available. Let's say you can no longer make a meeting but want someone else to take your place, or you organised the meeting but don’t need to be involved directly. Then you can change the owner of a meeting to someone else in your team. Simply click the More Actions drop down and select Change Owner… and move the chairperson role to someone else. Sometimes you just want to be aware of what’s happening around you, like knowing when Ramadan starts or national/state holidays. To find and subscribe, just click on the Other Calendars ‘twistie’ and select Browse Interesting Calendars.